Mount Marcy, Tahawus, Cloudsplitter, High Peak of Essex--- by any name, it is the tallest mountain in New York State. It stands 5,344 feet above sea level, a wild mass of old rocks and earth girdled by flourishing forests and grand gorges. There is no mountain in the world quite like it. The history of Mount Marcy is not dead history. It is a living history, and a broad history---about the Adirondack Park, about wildness, and about ourselves. Read its records. Sample its stories. Examine its memoirs. See if it doesn't excite your curiosity, enrich your mountain view, and make you want to split a cloud or two. Now distributed exclusively by Sandra Weber. or at bookstores throughout the Adirondack region. A wonderful job of research. with something to interest every reader. and the mix-up about its name. and as fresh as today. What a magnificent study of Marcy! I'm sure that Old Mountain Phelps highly approves. 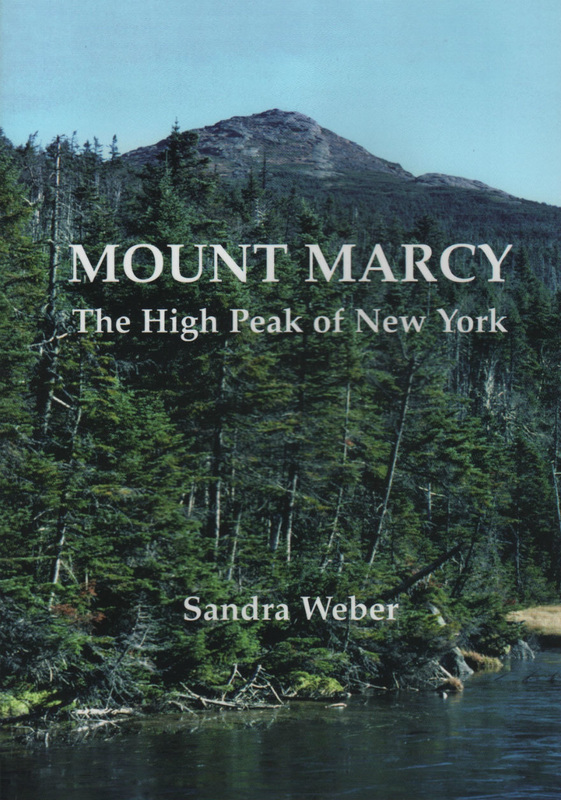 If you've been wondering about Mount Marcy, you need to read this book. Practically all that is known about this mountain has been assembled between these covers. The book begins with the mountain itself---its foundation of rock, its covering of forests, its alpine flora and its environment---but it quickly turns to its focus: people. Do not be misled by its title, for Marcy is merely the setting. The real story is the varied and fascinating cast of characters....In each of the chapters we learn more about the lure of Marcy, and how it fulfills the spirit, refreshes the soul, hardens the body. We come to better understand who came before, to savor their adventures, wince at their mistakes. We applaud their labors to protect the mountain, to pass it to us in good shape, to entice us to do the same for those who come after us. This book is a masterful work. It belongs in the hands of every Adirondack aficionado. Sandra Weber does something amazing and delightful in "Mount Marcy." She has hiked into a well-chronicled subject and returned with fresh perspective and surprising stories....Weber moves beyond capable research to appealing readability through organization, a nimble pace and a near magical gift for finding the right anecdote or concept....All of this makes for a vivid, often surprising and sometimes paradoxical picture of Mount Marcy and the people whose lives it touched.